When we invite friends for an afternoon tea I always ask myself what snack I shall offer to meet adult and children taste. Actually there are many choices, useless to say, you just have to prepare something sweet and everyone is happy. 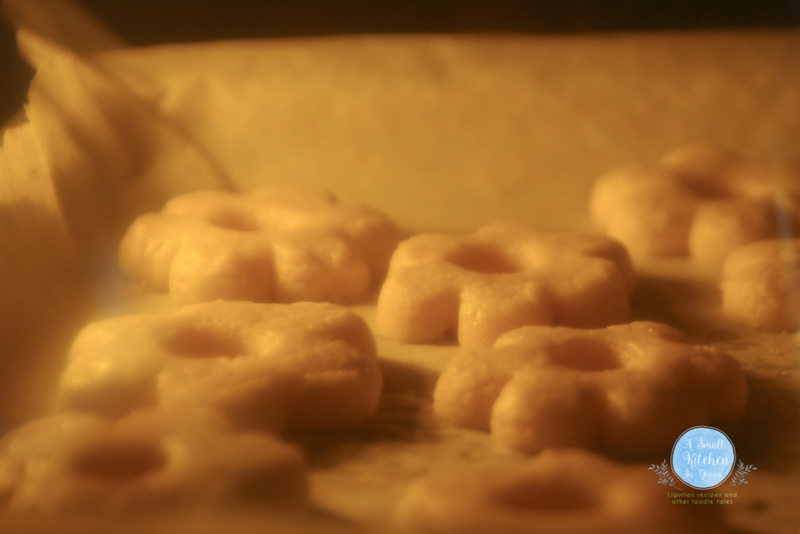 However, who knows why, I often find myself thinking that the best solution is to offer small cookies, of a funny shape, generously dusted with powder sugar. I think of cookies crumbly but not so much to smash before arriving at the mouth after a dive in the tea. 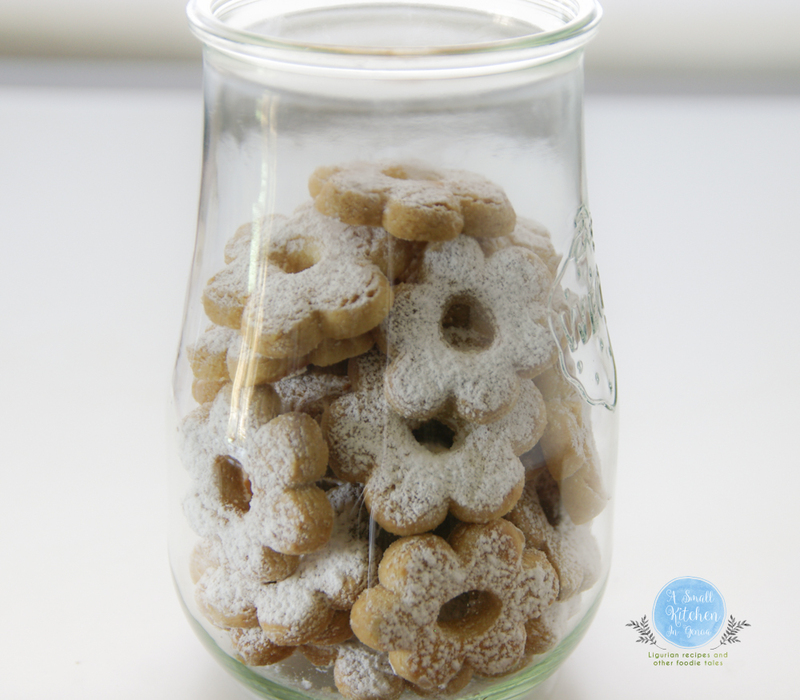 But most of all I think of cookies to prepare at the very last moment –my invites for a tea are so, made just after the sky threatens rain ‑ with ingredients ready at home and so easy that I can prepare them with my son hanging around in the kitchen. So, what I usually find myself thinking of just after having hang up the phone are the Canestrelli of Torriglia. This is the king of the Ligurian cookies, said to have been created more than five hundred years ago in Torriglia, a small village in the backcountry of Genova. 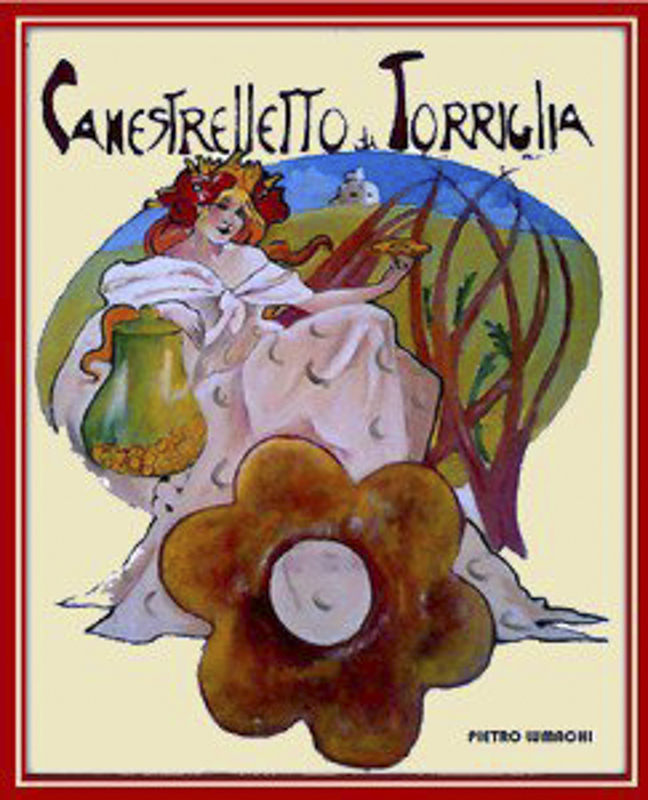 Here at the beginning of the summer the “Festival do canestrelletto di Torriglia” takes place and is organized by the local producers. Notwithstanding this they were SO SO good that I prepare them as soon as I can. 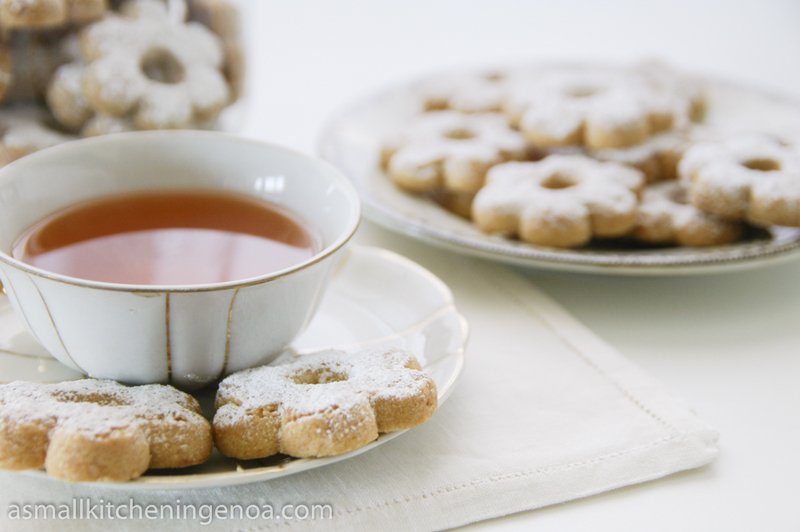 Here below my recipe, maybe one of the secret recipes of the eight patisseries of Torriglia maybe just one of the many recipes existing of this legendary cookie, we will never know. In any case the taste of these cookies is so similar to those I had in Torriglia that the recipe is definitely a good recipe!! 1. Leave the butter out of the fridge for 5-10 minutes. 2. If you wish to knead with your hands, Put the flour on the working surface and make a well in the center. There add the butter at room temperature diced. 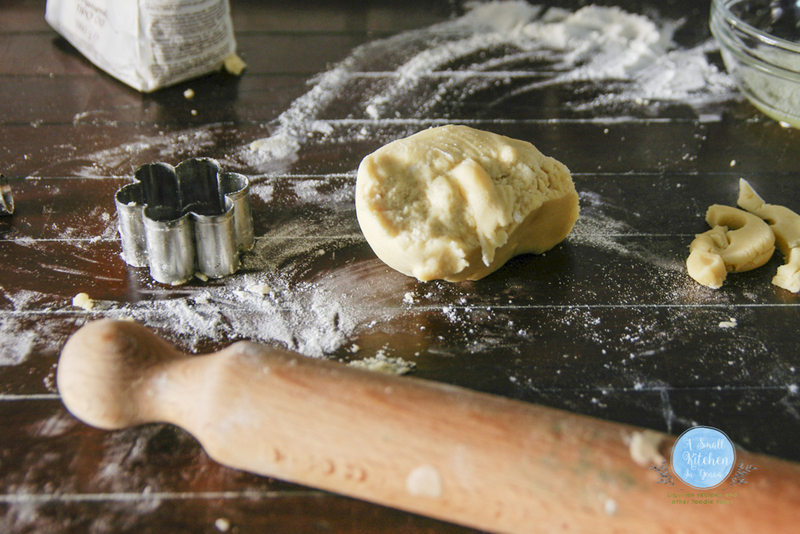 Work quickly with your hands the flour with the butter to form a crumbly dough. Add the sugar and work again. Finally add the yolk and the lemon peel greeted. Work the dough just until compact. 3. If you wish to use the kneader, put all the ingredients in the bowl and mix on a medium speed just until the dough compact. In both ways the dough must be worked very few in order to avoid that the butter get too warm melt and compromise the crumbliness of the cookies. 4. Roll out the dough between two sheets of waxed paper and let the short pastry cool in the fridge for at least 30 minute (if the dough remains in the fridge longer it will be easier to cut the biscuits and they will remain more crispy. If you wish you can also prepare the cookies later and leave the dough in the fridge overnight). 5. Pre-heat the oven to 180°C and line a baking tray with baking paper. 6. Take the dough out of the fridge, generously dust with flour the working surface then roll the dough with a pin to 1 cm thick. 7. 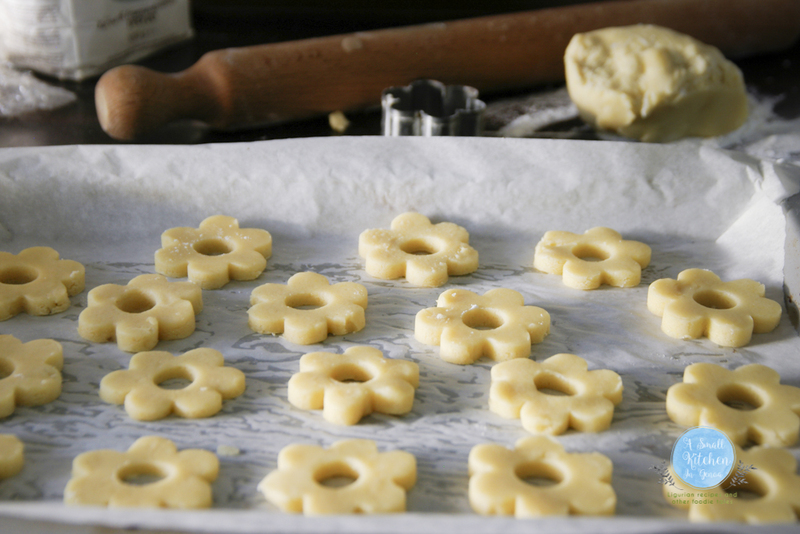 Using a cookie cutter with the shape of a flower of at least 5 cm diameter cut out the biscuits, making a hole in the center of about 1,5 cm width. Obviously knead again the clippings were quickly and repeat the operation to make other cookies (if the dough becomes sticky, put it in the fridge for 10 minutes). 8. Place the cookies onto the baking tray leaving a small gap between each of them so that they do not stik together. 9. Bake for 20 minutes or until lightly golden. Most of us granddaughters make the cookies. Teaching my daughters and granddaughters. I have one flower cookie cutter and can’t find any more. Would you know where I can purchase more? where does the egg white go? Hello! Thank you for asking! I forgot to write it! You brush the cookies just before putting them in the oven!